Still editing and updating Church Avenue. While the following photograph is not the best quality, it does give some indication of the impressive signage of the Flatbush Theatre in the 1910s. 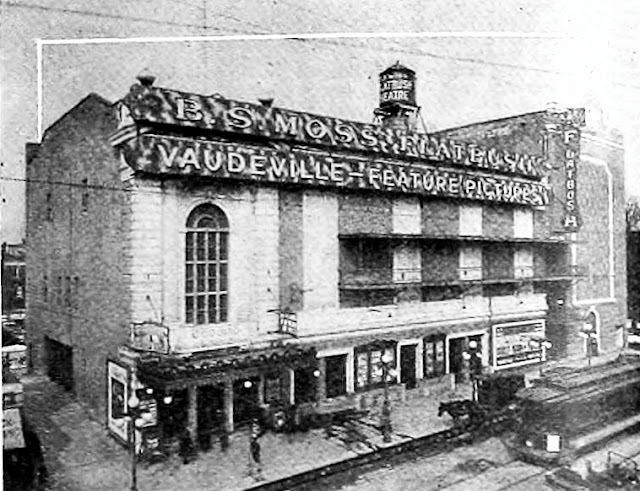 "At night the front of the theatre is as bright as day, being well illuminated by several five-lamp electric posts, a number of arc lamps and two huge electric signs, one of which measures about 250 feet in length; the other is a vertical sign and measures ninety feet in height. The use of electric signs is one of the most effective ways of attracting the attention of passerby. "A glass-covered marquee adds greatly to the attractiveness, lending the finishing touch to the front of the house."